The holiday season is right around the corner and retailers are gearing up for what hopes to be another successful season. Experts predict that this year, holiday retail sales will grow 3.3%, slightly more than last year’s upwards trend of 2.1%. However, the more important statistic is the dramatic 17.2% growth in e-commerce sales expected this holiday season compared to 2015. As gift buyers shift to digital channels in ever larger numbers, retailers will need to work harder to win over online shoppers, especially on mobile. As more consumers go first to Amazon to look for products and compare prices, retailers and search engines are losing ground as the starting point for consumer searches. Retailers’ share of “first searches” dropped 16%, and search engines such as Google, Bing, and Yahoo fell 28%. 41% of consumers said improved personalization would make them more likely to buy from a retailer over Amazon. Only 1 in 3 cited Amazon’s site personalization and product recommendations as superior. 58% of consumers left a retailer’s site for Amazon after having a poor experience, while 30% left Amazon after a bad site experience to shop on another retail site. Consumers’ desire for personalized, high-quality experiences means that retailers will need to work harder to ensure they are offering multi-channel experiences that are seamless and relevant. Retailers should emphasize improvements in omni-channel fulfillment for the holiday season and beyond. 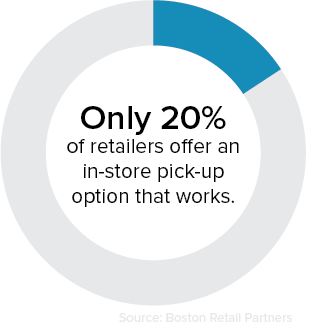 Currently, fewer than 20% of retailers are able to offer an in-store pick-up option that works well, according to a Boston Retail Partners’ report conducted in June. To make matters interesting, this year, Hanukkah starts on the same day as Christmas Eve, meaning holiday shoppers will most likely be making more purchases closer to Dec. 24 than ever before. And that’s where the big opportunity for brick-and-mortar retailers presents itself. Last year, nearly half of all retailers had a cutoff date before Dec. 21 on orders to be delivered before Christmas Day. But, nearly two-thirds of all online shoppers last year were not finished with holiday shopping by Dec. 21. Traditional retailers have the opportunity to capture those sales by initiating, or improving, their omni-channel fulfillment programs to include in-store pick up for purchases right up until Dec. 24. And consider this: during this year’s back-to-school shopping season, more than half of all shoppers planned to use buy online and pick up in-store fulfillment options. Even Amazon has been capitalizing on the opportunity with its Pickup Points program and has even more options coming with its Bookstores and Pop-Up Stores. Data is the key to success for better omni-channel experiences. It should come as no surprise that consumers engage with your brand across various and disparate channels and devices, creating multiple, anonymous identities and profiles within your databases. Capturing and integrating consumer data across devices and channels is a major challenge for retailers. Yet personalization and targeting strategies and tools rely heavily on rich, robust cross-channel data in order to succeed. They are more effective when powered by insights into who the customer is and how they’ve engaged with your brand. Retailers can begin bridging that gap with people-based marketing. They can create custom audience graphs to match data across devices and channels using the identifiers that make the most sense for their brand. By connecting their website, mobile, point of sale, CRM, and ad campaign data, they can create persistent consumer profiles. Optimizing existing data will allow brands to target their customers more precisely and infer more accurate buying habits. It’s more important than ever for brands to get to know their customers on a deeper level, and to empower them to shop they way they want. Leveraging your brand’s first-party data is a crucial first step.